25.5.2013, Polytechnic Institute of Technology, Christchurch, New Zealand. 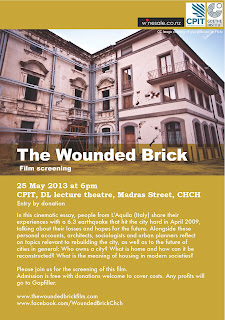 The screening is hosted and introduced by Sarah Borree and supported by Goethe Institute New Zealand. So, if you want to know more about Christchurch, read on. We hope the screening of "The Wounded Brick" will contribute to the ongoing discussions in Christchurch about rebuilding the city.